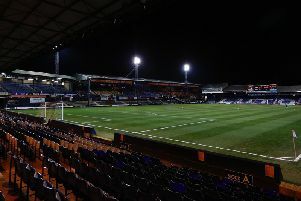 Luton Town reached the final of the Beds Senior Cup as a last-minute goal from Frankie Musonda defeated Bedford Town 1-0 on Tuesday night. The visitors took a young side to their Southern League Division East opponents, with only Akin Famewo, Aaron Jarvis, Jack Senior, Kavan Cotter, Arthur Read and Musonda who had experienced first team football this season. The hosts made a bright start, with James Peters going close from an acute angle, while Town’s first real opening came on 20 minutes, Connor Tomlinson’s low effort just missed by Jarvis sliding in. Midway through the opening period, Town threatened again as Famewo’s ball down the left was controlled by Senior with his cross volleyed over the top by Tomlinson. On the half hour, Luton had another fine chance, when the ball fell nicely for Jarvis from a corner, but he dragged wide of the target. Eagles player Dean Dummett then had to go off injured as Tommy Hull came on. Jarvis, back from a loan spell with Boreham Wood, went close again as he reached Joe Mead’s right wing delivery, only to see Eagles keeper Kyle Forster tip over the bar. The ex-Basingstoke striker had another effort when he took sub Michael Shamalo’s through ball in his stride and rounded Forster but was forced wide before Cotter eventually shot into the stands. Town then had to weather some pressure in the closing stages, as Ciaran Gordon-Stearn tipped over former Luton youth team player Devante Stanley’s effort that was heading for the top corner. Stanley then almost stole victory for the Eagles when his powerful strike was parried by Gordon-Stearn. However, Luton went on to win it in stoppage time, Senior’s cross turned home by Musonda at the back post. Town professional development phase lead coach Inigo Idiakez said: “I am delighted. I think we did really well in the first half in difficult conditions. We had a lot of possession throughout the game but didn’t really create anything in the first half and the second half was a bit scrappy. “Both teams had to play long balls and try to win second balls in this kind of game. In the end we managed to score a goal and we reached the final, which everyone in the changing room is obviously happy about. Idiakez knew his side had to alter their tactics for the second period to try and impose themselves on proceedings, as he continued: “I think we certainly tried to play in the first half, which was a bit better, but it was really difficult conditions. “We changed for the second half and just went a little bit more direct and play off second balls, as well as try to get crosses into the box. “It was not the best game to watch to be honest, but we’re going to the final and the team are happy about this. “Two finals in a year is good, considering we started the year quite badly. On the performances of Town’s young pros like Musonda and Famewo, Idiakez added: “It’s difficult circumstances for them. “They have to play because they need minutes as they probably haven’t been involved in first team football as much as they would have liked. Hatters will now face Southern League Premier Division side Biggleswade Town in the final at Kenilworth Road. Town: Ciaran Gordon-Stearn, Frankie Musonda, Joe Mead, Akin Famewo, Jack Senior, Kavan Cotter, Drew Richardson, Arthur Read (Scott Belgrove 67), Josh Neufville (Toby Byron 74), Connor Tomlinson (Michael Shamalo 58), Aaron Jarvis.